I have had these pictures just sitting on my hard drive waiting to be scrapped for almost 3 years! I cannot believe how fast I am getting caught up now! Mind you, I'm still forever behind but it's so much better than it was a month ago! I love digiscrapping! I've noticed I've been using a lot of blue lately. Weird. I'm so not a "blue" person. Here's another template LO. 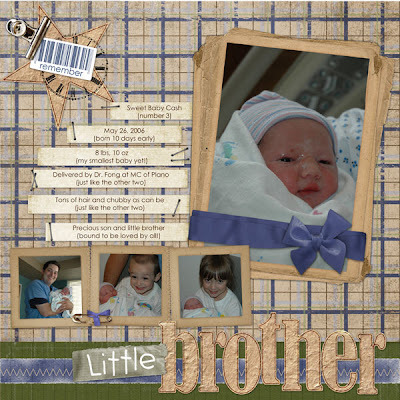 This one is from the Tuesday Template Challenge over at ScrapMatters.com. I'm so happy with this final LO. I looked and looked online for some Spiderman clipart but none of it was high res enough to use. I think it still looks very "Spidermannish" (yes, that's really a word!) I can't believe how much scrapping I've gotten done since switching to digi. 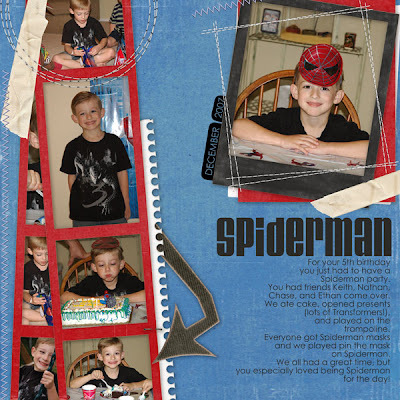 Ryley's only other birthday page in his album was from his first!!! Yes, this was his 5th birthday. How sad am I? Now, I just gotta get printing all these pages so the kids can see them too! I got my issue of Memory Makers Magazine today and there's a free download (digiscrapping) on their website. Click here for the link. It's a really cute girly kit - sorry, Brianne! There are also some good freebies over at ScrapMatters.com. They have a link for freebies. 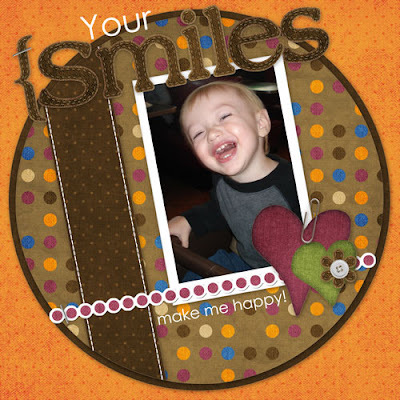 I really like the fasteners freebie and use it all the time. It has a little bit of everything - all in one place. Hope you enjoy the free stuff! I know I do! I really thought about doing it all digitally but I decided I'd better not. So I compromised. 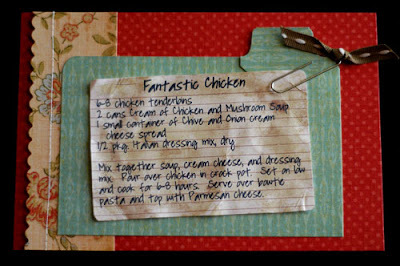 The index card looking piece is actually a digital element (February Idea Book by Gina Cabrera) that I resized and printed my recipe on. I just printed out a bunch of them (on regular white cardstock), crinkled it up to make it look even older and stuck it on! It saved me a lot of time finding paper that looked like an index card or using an actual index card and printing on it - not to mention trying to load a little index card into my new printer (that I still haven't quite figured out yet!) I also didn't have to distress it with ink or anything - it came that way! Yipee! I am so lovin' digital! It was fun to play with my paper and other tools though. I even whipped out my sad little sewing machine. I have GOT to get something else before I can start sewing my rag quilt. I don't want to ruin all my hard work with this crappy machine! Well, I'm off to soccer practice and then cardswap! Yea! Well, here it is. The moment you have all been waiting for! ha ha! I was in complete shock when they emailed me to let me know I was part of their new CT. I just applied as "I'll never get it, but I might as well try!" I'm so excited! In response to one of Sarah's comments about my blinkies - yes, they do mean something. ScrapMatters is the CT team I'm on, ADSR and the Scrappy Sisters are the race blinkies for me and Brianne, and the Digital Candy one is because I'm participating in their Masquerade Contest. You can click on the Digital Candy one to take you to the gallery for the challenges and see if you can pick out mine. It's totally anonymous so I can't tell you which ones are mine! The ScrapMatters blinkie will also take you to their site. The Scrappy Sisters one will take you to someplace (I 'm not sure where yet, either a blog or a gallery) where you can see our LOs for the contest. 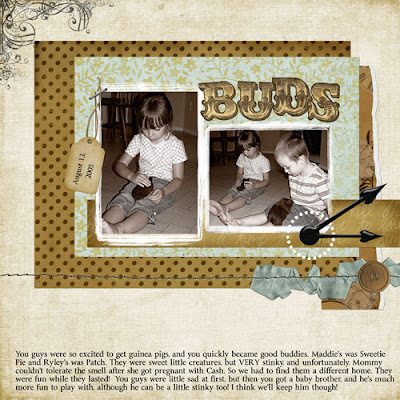 More info on my family blog. I have found all the templates I've used for free so far. This template came from a Digital Candy challenge. I'm really digging challenges right now too. (Can you tell from all my Digidares?) I have such a hard time figuring out what to scrap and what to use that I find it really easy to scrap when someone else tells me what I have to use or what kind of page to do. It's so much easier for me. If you find a cool challenge out there let me know! Well, here's my latest Digidare LO. I haven't won any of them or even been the random winner - not that I expected to or anything - just FYI. I have, however, won a few challenges at other random sites and gotten a few gift certificates and freebies. How fun! Anyway, the dare this week was to do a page about someone you love using nontraditional Valentine's colors and some fun brushwork. I don't know if this LO actually fits into all those categories but I really like it anyway. In other news, the Amazing DigiScrapping Race should be starting soon and I'm excited! I really enjoy challenges because they force me to get a page done. If I had to think of everything I would never scrap anything! It's too overwhelming to look at all my pictures and scrapping stuff and try to make a decision on my own. For those of you who want to start digiscrapping but have no idea how it works here's a quick tutorial. There are tons of freebies (papers and elements) online. Check out the site links to the left and search for freebies. You can also download a free trial of Adobe Photoshop Elements at adobe.com. 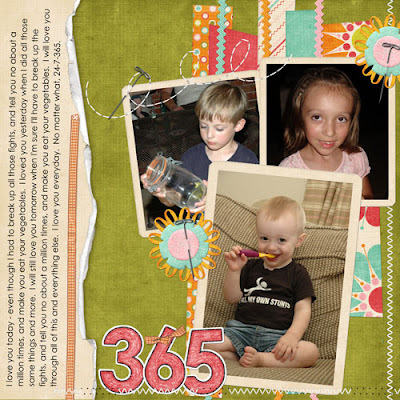 There are a ton of other tutorials online, just do a google search for digital scrapbooking tutorials- you'll have a never-ending supply! It's pretty easy once you figure out the basics. There are alot more advanced techniques that I have know idea how to do yet, but it's fun learning! If you have any questions please leave a comment or email me and I'll try to answer it or find the answer for you - I don't know much about this yet, but I'm willing to share what I've learned so far! Have fun! 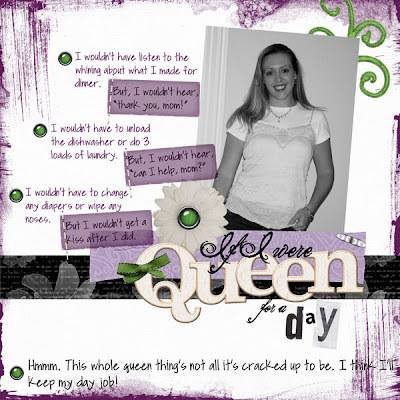 So, I guess I should rename this my scrapblog, because that's the only "crafting" I've been doing lately! I do have two quilts in the making and as soon as I get to a point that isn't just pieces I'll take some pictures of those. In other news . . . I made bread today!!!! That counts as something crafty doesn't it? Woohoo for me! Before you say, "So, what's the big deal?" just be aware that I have NEVER been able to make bread before, even with a bread machine! That's right, I'm the biggest idiot when it comes to making bread. I don't know why. I'm normally not that dumb, but bread has just been beyond my capabilities - until now! I am so proud of myself. I even made it from scratch and without a machine! (Patting myself on the back!) Anyway. . . I did actually do another LO. Here's another one for Cash. I'm doing a lot of him because the poor child has like three pages total in his paper album. I know I haven't done any for Maddie, but that child has like 3 full albums already! This was my first time using a template. I just didn't get how to do them, but this one was a freebie that came with good instructions. It wasn't difficult once I could wrap my brain around it. Also today I learned how to make a blinkie and put one on my blog. Check out our (Brianne and I) ADSR team blinkie - that I will probably change - and the official ADSR blinkie. I don't think they will link you to anything. I haven't figured out how to do that yet. Still trying to figure all this html stuff! 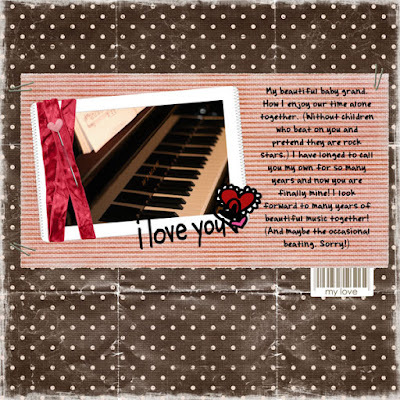 This week's Digidare was to write a love letter to some"thing" - not someone. At first I thought I just wouldn't do it this week because I could not think of anything that I "loved!" Then, as I was playing the piano yesterday morning I thought to myself, "I really LOVE this piano!" and then I realized I had my LO! So, that's the story behind this LO. I really wouldn't have done a whole page about my piano if it wasn't for the Digidare. I'm not that weird! I decided to try something a little different. Definitely not my usual style!